Everyone I meet seems to think I live in the outback as soon as I mention I live in Ipswich City. I really have no way to hide the fact I sort of do live on a (very small) farm, as we have started keeping chickens as a source of eggs (and an entertainment option if you are me). I think as soon as you start keeping livestock, you’re a farmer. We originally bought in four hens from a local rural supplier. As we never had cared for chickens before, we decided to get a copy of Jackie French’s Chook Book (which has turned out to be a great first guide). The book discussed the possibility of sourcing ex-battery chickens (the poor souls who lay cage eggs you buy in the supermarket) as a way to also get hens and treat battery chickens to a second lease on life. As dedicated animal lovers, we immediately took the opportunity. 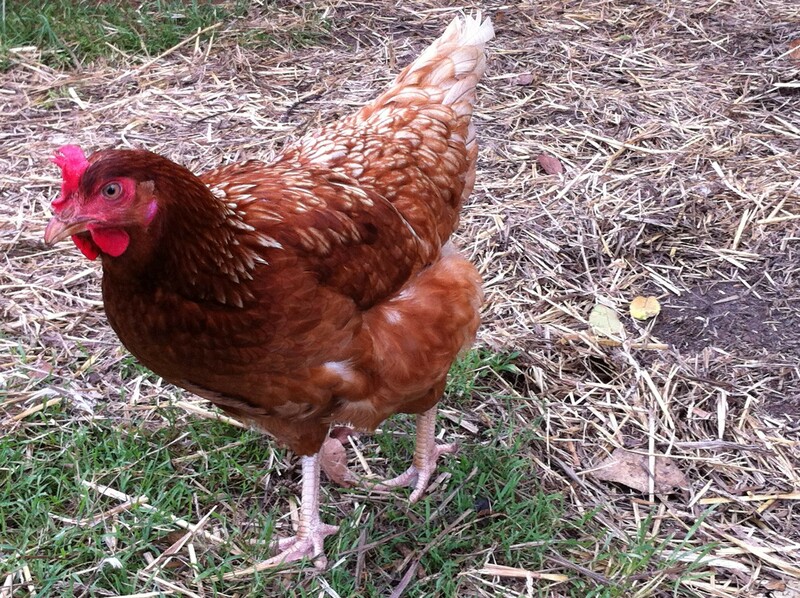 We received four additional hens on Sunday from a local ex-battery hen adoption program (called Homes for Hens). As animal lovers, we always try to buy free-range everything (where it is available in the uncultured location that is Ipswich), and we have always used free-range eggs. I always knew cage eggs were come by under depressing conditions for the hens forced to lay them; I’d never given it much further though. The adoption program really made it clear just how poorly battery hens are treated. The hens, when in the battery, are given roughly an A4 sheet area to live on. This as it turns out does not provide enough room for the hens to stretch their wings, an important part of a chicken’s self-care. They are exposed to continuous fluorescent lighting 24x7x365 to break their normal cycle of egg laying, forcing them to lay more eggs than is natural. Shortly after being born, battery hens have their beaks trimmed; unlike clipping a human fingernail, clipping a hen’s beak cuts through nerves causing a great deal of pain. The beak never grows back. Cutting the beak makes it difficult for the hens to eat. They constantly peck each other due to being packed so closely together, perpetuating the need to cut their beaks. They are given only a wire cage (wire on all sides) to live in and the limited size means their feathers are rubbed off, and the constant light causes the hens to put all their nutrients into egg laying rather than growing feathers, bones and other parts normal in chickens. Because cages are open at the bottom, they expel their waste onto the chickens below (cages are stacked one on top of another in long rows). After a year of this terrible ordeal, the hens are treated to slaughter (male chickens born in this system are killed by gassing or some other disturbing method as soon as they are born). This is hardly a just way to treat chickens that have gone through so much. 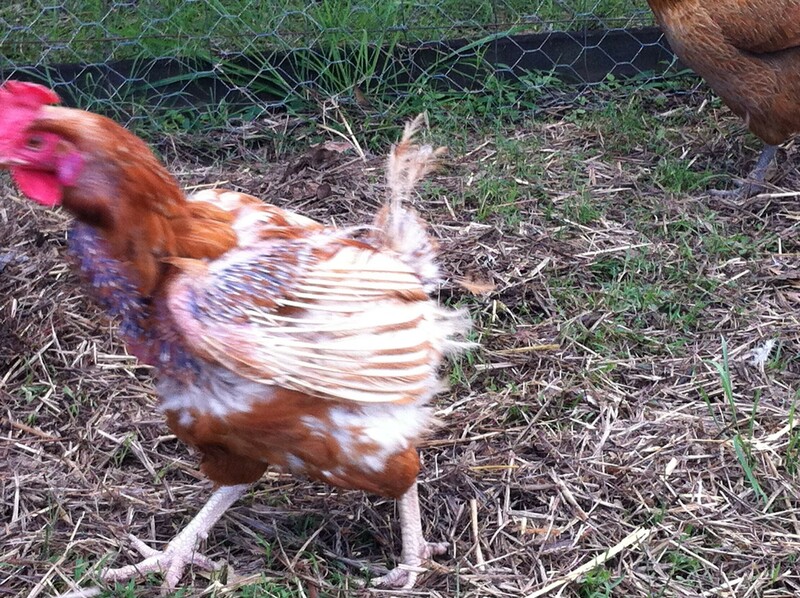 Below I have some photos of our initial chickens compared to our adopted ex-battery hens. 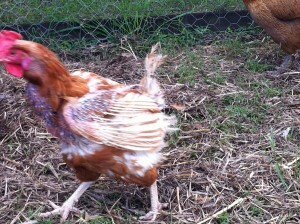 The poor ex-battery hens are emaciated. They were never treated with respect. They have trouble doing normal chicken activities (like foraging and finding food and water on their own). I am disgusted this is allowed to happen in Australia. The EU is phasing out caged egg farming by the end of the year. If you purchase cage eggs, you should feel extreme guilt. These inhumane farming practices are perpetuated by your decision to buy cage eggs over free-range eggs. You cannot tell me you cannot find the extra dollar to buy free-range eggs when 11 million hens are suffering in Australia to satisfy your need. For each cage egg you buy, a helpless, voiceless, innocent animal has suffered for 30 hours. The solution is simple: buy free-range eggs. While the farming practices here are not free-range in the exact same sense we at home operate free range, but the hens are treated with infinitely more dignity and are not treated to the same horrors as their unfortunate caged counterparts. If you have enough room, you really should investigate if keeping a few chickens yourself is a possibility. With a lot of TLC, I am expecting we will be able to rehabilitate these chickens and allow them to have a long, happier life. I love this Trent! 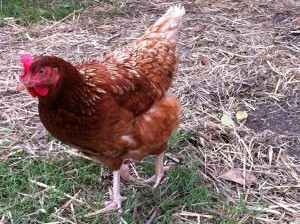 Wish I didn’t live in an apartment so I could adopt some hens! But seriously, good work on spreading the word. feel so sorry for those caged hens, people who continue to buy cage eggs are disgusting! Yes an apartment makes things hard! But the good thing is you know that the problem exists, which apparently a lot of people don’t. Our local (admittedly small) IGA sells mostly cage eggs in an area I would assume is fairly aware of the issue and where people have the room to care for their own chickens. Thanks for caring about these helpless little creatures! Those poor chooks. Good for you for adopting them and giving them some semblance of a life. Free range eggs are one of the few things that I find the extra dollar for. And I agree with you- how is this allowed to continue in Australia in 2012…?